Use these links for Troops and Lead MB Counselors. Your troop is invited to apply to attend the 9th Annual Merit Badge Camporee. Make sure to add this event to your planning calendar for 2015. This Camporee has grown each year and has been rewarding for both the scouts who have participated and the Merit Badge Counselors who have given of their time. Due to the success of this event it will be an Invitational again this year and we will be limiting attendance. You are asked to complete the online form by the January 8th, 2015 Indian Rock District Roundtable to be considered for invitation. Each troop is required to provide counselors for at least 2 badges; however we ask that you provide additional counselor(s) if you have a large troop (10+). If your counselors can teach various merit badges please have them complete a Lead Counselor form for each of the ones they are willing to teach. This allows a better variety of courses to be taught and gives us options when developing the best possible schedule. Ideally, if you are teaching a merit badge, you should also provide supporting adults from your troop to assist. The success of this event depends on the willingness of each troop to share their talents with the other troops attending. Troops will be selected to attend based on their willingness to lead merit badge sessions compared to the number of boys they plan to bring. If we have many counselors for the same merit badge, we will give special consideration to those troops offering unconventional MBs. Last year the event hosted 285 scouts and 100+ scouters; make sure you apply on time so you don’t miss out on this great event. 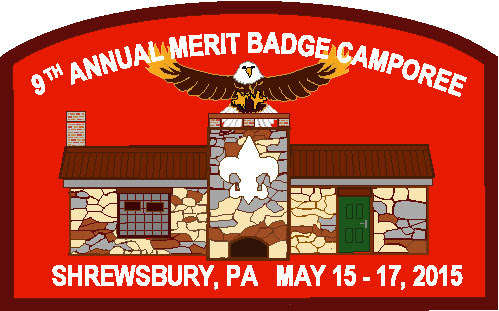 Merit Badges Offered in previous years. Engineering, Entrepreneurship, Farm Mechanics, Fingerprinting, Fire Safety, Fish and Wildlife Management, Forestry, Genealogy, Geocaching, Geology, Graphic Arts, Indian Lore, Inventing, Law, Leatherwork, Mammal Study, Music, Orienteering, Photography, Pioneering, Plumbing, Public Speaking, Radio, Rifle Shooting, Safety, Salesmanship, Scholarship, Search and Rescue, Shotgun Shooting, Space Exploration, Stamp Collecting, Swimming, Theater, Traffic Safety, Truck Transportation, Veterinary Medicine, Weather, Welding, Wilderness Survival, and Woodcarving. If there is a badge not listed that can be taught in a one or two session time frame, please feel free to add it to this list by having the counselors complete the form below. We offer four 3-4 hour merit badge sessions one each Friday Night, Saturday Morning, Afternoon, and Evening. Also, if there are any requirements that can not be completed in this time period, please list these as Prerequisites. This will ensure that the boys can leave with completed blue cards. Each troop needs to provide at least 2-deep-leadership for the entire weekend. The success of this event is dependent on the availability of Merit Badge Counselors from each troop that attends. This allows for the most variety in badge selection. Each troop needs to volunteer to teach at least 2 merit badges over the course of the weekend. If you are not sure what needs to be done, feel free to ask, we can give you advice on what has worked well in the past. If your troop is interested in participating, please discuss this with the adults and youth within your troop to see who is willing to lead a merit badge session and to make sure you will have the two deep leadership required. Keep in mind there is no limit to the number of adults you send; however, only Merit Badge Counselors and assigned Assistants attend free for the weekend! This is an all-volunteer effort; many hands make light work. Copyright © 2014 Boy Scout Troop 90, All rights reserved.